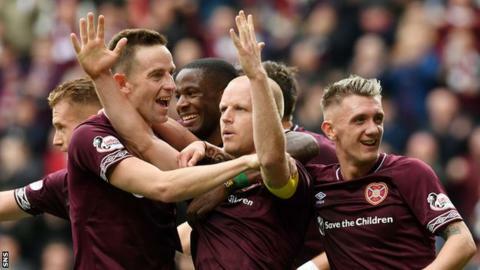 Striker Steven Naismith says signing a permanent deal with Hearts is a "really appealing option". The Norwich City forward, 32, is out of contract in the summer having been on loan at Tynecastle since last January. A chance to move to Major League Soccer has been tabled to the striker, with Hearts also keen to keep him in Edinburgh. "It's something I've thought about. Hopefully I can come to a conclusion sooner rather than later," he said. "The opportunity Hearts have given me over the last 18 months has been great for me. I've enjoyed every minute of it and the relationship I have with the manager and the way we have chatted is definitely a really appealing option for me. "When, as a family, I know exactly what I want to do, we'll move forward rather than let it drag on." Naismith is currently out injured having had knee surgery last week. It means he is unlikely to feature in Hearts' Scottish Cup semi-final against Inverness Caley Thistle next month, while he will miss Scotland's Euro 2020 qualifying double header next week. "I'm not going to say I'll definitely be back [before the end of the season] but all round it was better than expected," he told BBC Sportsound of his operation. "When you go in for an operation and they are normally saying it was slightly worse but this was better. It's a rapid incline once you've passed the first hurdle." The Scotland forward currently sits on 49 caps and needs just one more to reach the Hall of Fame. Naismith admits this now must be a "realistic target" for him once he is back to full fitness. "As a kid I never really expected to get any caps so to be flirting with the prospect of getting in the hall of fame is quite incredible," he said. "I'll hopefully get there one day. "When you are a kid and you go with your boys club to Hampden to watch Scotland, you are sitting there with it being a show. I never had a real thought of thinking I'll play for Scotland. "It's when you think back on the games you played in, you realise how amazing it really is."